The Man of Steel returned earlier this month with a casual new look and startling new storyline that’s unspooling in the pages of all of the Superman books. Exposed and nearly powerless, Kal-El’s life takes a dangerous turn in this week’s ACTION COMICS #42, which places Superman in between a squadron of (possibly corrupt) riot police and a neighborhood gathering that’s being held in his honor. It’s a chapter that’s ripped from the headlines in what’s quickly developing into one of the most gripping and relevant Superman tales we’ve seen in quite some time. Recently, we spoke with the two men helping to bring it to life, Action Comics writer Greg Pak and artist Aaron Kuder. Why all the changes to one of our most beloved and longest running heroes? Read on and find out! What has the public reaction been so far to the changes you’ve made to Superman? 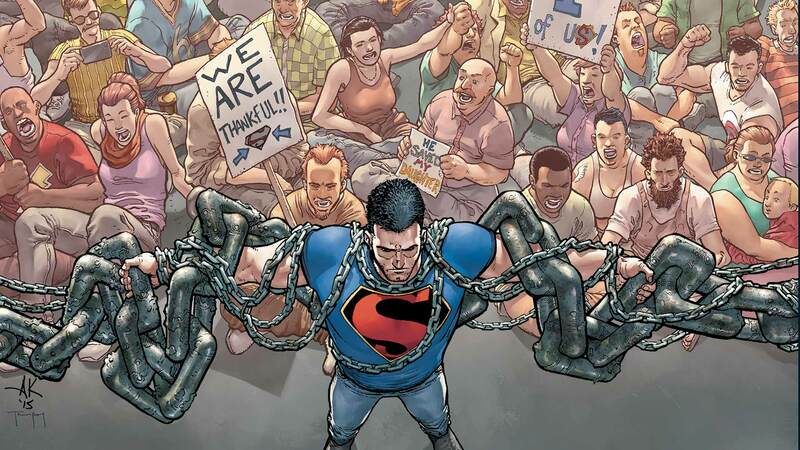 Greg Pak: Superman is such an iconic character that just about everyone on the planet has an image in mind that represents his or her personal Superman. And those images are all different, depending on when a person started reading and what stories in particular resonated. So of course when you change things up, you’ll see a certain number of “That’s not Superman!” reactions. But it’s been a thrill to see folks get excited with us as they see and read and start to see how the new story organically develops themes we’ve been building for the last two years while opening up entirely fresh storytelling possibilities for the Big Blue. We love Superman. We hope you’ll dig where he’s taking us. Aaron Kuder: A few weeks ago I was on a plane flying to a show. I was very excited about making Superman comics because we were just getting to the meat of it all, which for me means I was getting to draw. We had spent hours, days, weeks going back and forth hashing out plans and plots, but finally I was getting to DRAW IT. All I wanted to do was work. I didn't want to be on a plane. I didn't want to be anywhere out of my studio working. So I tried to work on the plane (never fun). The trouble with drawing on a plane is that people like to look, and looking leads to asking, and asking leads to polite conversations about their friends or family members that draw or just really like comics. Which is all normally quite wonderful, talking to people outside the bubble of comics and seeing their excitement about this world of super heroes that we work so hard to breath life into. However, I wanted to work. Stuck in the middle seat, between an older lady that could have been someone's aunt or young grandmother and a gentleman who didn't seem like he belonged in coach. Both people were prime suspects for distractions. So I popped my headphones in and ignored all movements around me. By the time the plane landed, I could tell both people really wanted to talk and find out what I was doing. Making magic on a tablet. The lady to my right was indeed an aunt and a grandmother, and she has a nephew who is "a rather troubled soul, but wonderful writer," and asked about putting him in contact with me. The gentleman on my left was a businessman. We chatted as the plane circled the gates looking for the right one. I told him exactly what and who I draw for a living: Superman. Action Comics. He, like most people I would tell, got very excited. He, like most people, told me about how he loved comics growing up and Superman was his guy. I think he even told me he had a Superman "S" tattoo. At this point, I told him that Superman was about to go through some changes. The cover to ACTION COMICS #41 had just been released online. I showed it to him, wanting to see his reaction. And honestly, it wasn't what I wanted to see, but I was prepared for it. He visibly scoffed, it was almost funny. I almost felt bad. I had made him happy to have met the guy that draws Action Comics, and here I was showing him some dude in a T-shirt and jeans. He asked, "What are you doing to Superman?" I explained it was a part of the story... Every hero has a story right? I told him about our intent on getting to the core of who Superman is—what a hero is. And how this story is ultimately our way of honoring the historic journey Superman has taken in his 76 years. The plane found a gate to dock at, and people started perching on their seats to jump up as soon as the seat belt light clicked off. The guy next to me sat there, unperched. Chewing on what I'd told him. He turned to look at me, his eyes trying to read something in me, and said, "Yeah... Okay. That sounds cool. What's your name again? I am going to have to pick this up." I smiled and said that'd be great. We all gathered our things, and got off the plane. The aunt lady got the proper spelling of my name and said her nephew will be in touch. To my knowledge I haven't heard from the nephew, but the businessman found me online and sent me a note saying he's still looking forward to seeing what's to come and he's picked up the Volume 5 collection of Action, and he really likes Baka. How will the revealing of Superman’s identity continue to affect Clark moving forward? Greg: What happens when your biggest secret gets revealed to the world? Does it destroy you…or liberate you? Will Clark change, or will it just confirm everything that made him Superman in the first place? How long can I continue to answer your question... with more questions??? Aaron, how would you describe the change in the visual tone the series has undergone? Aaron: How would I describe it? Paired. Like a fine wine with a good meal, or beer and burger. The look is matched to the story. That's in fact how the initial design elements started changing. Greg, Gene, John, Pete, Eddie and I worked together to create the story here. As we pulled together story elements, the images floated into play as well. The T-shirt. The jeans. It wasn't rocket science coming up with the "look," but it fit. How does it affect Clark knowing that many citizens of Metropolis do not support, and even hate him? Greg: We’ll explore that big time in Action Comics. Some of the people Clark cared about the most in the city now hate and fear him. And at the same time, he’ll find he has some unexpected new allies—and rivals. Keep your eyes open for a brand new character named Lee Lambert in particular. She’s a firefighter who lives in Clark’s building and becomes a leader of the community that grows there after the reveal of Clark’s secret identity. Can we expect to see Lois Lane and Clark come face to face in the future? Greg: Absolutely. You’re going to see the whole story of how Clark’s identity gets revealed in Gene [Luen Yang] and John [Romita, Jr.]’s Superman book, which of course will feature Lois and will be awesome. And Lois and Clark have some big moments in Batman/Superman that touch on their relationship post-reveal. Dontcha dare miss it! ACTION COMICS #42 by Greg Pak and Aaron Kuder is available tomorrow in print and as a digital download. Also, don’t miss the latest issue of Greg Pak’s other series featuring the Man of Steel, BATMAN/SUPERMAN #21, which is now in stores.